The future of the entire Island is dependent upon strategic planning that will build our urban and rural areas, protect the environment and create economic growth. 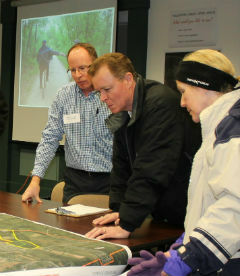 Municipalities build for the future with land use planning. Through thoughtful planning, municipalities can create a long-term vision that preserves the things we love about the places we call home, while protecting ground and surface water, agricultural land and fragile areas. Municipalities build for the future with economic development. Municipalities can grow and build the right climate for businesses within our communities. By providing modern infrastructure and services, promoting tourism, and attracting events, municipalities support economic growth. Municipalities build for the future with environmental sustainability. Municipalities can protect our natural resources through sustainable wastewater disposal, tree planting, and energy and water conservation programs. There are 63 municipalities, but most are very small and they only cover about one-third of the Island. This leaves much of the Island without the planning and services needed to support economic growth and puts our land, water and environment at risk.